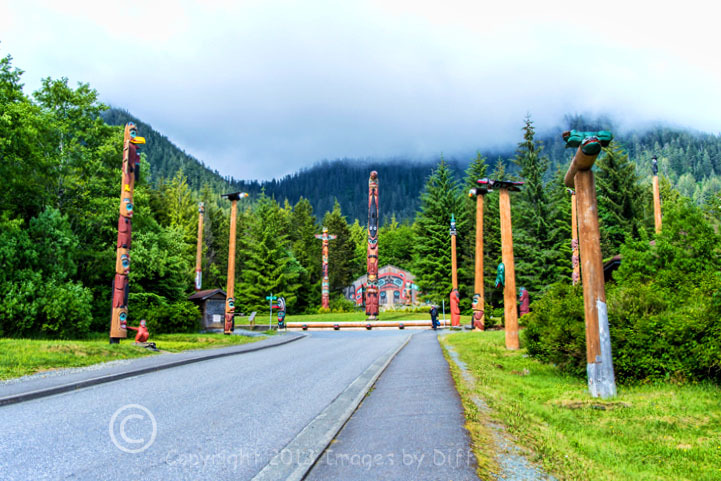 click photo to enlarge Ketchikan boasts they get 13 feet of rain each year, and true to form, it rained while we were there. 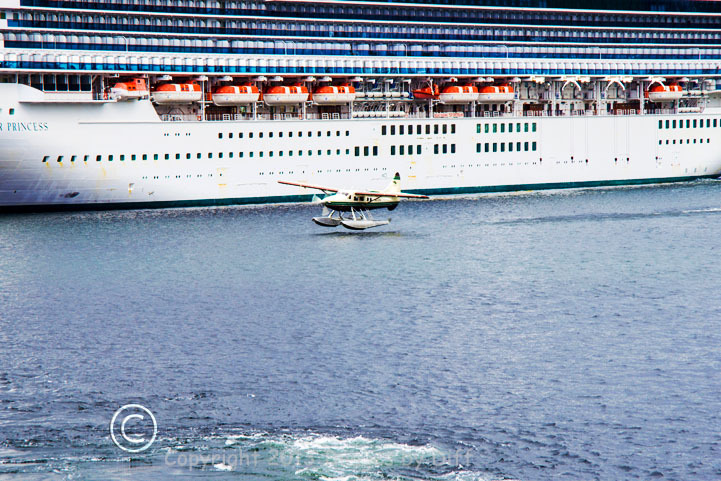 One of the things that amazed me, as we were coming into Ketchikan, was the float planes taking off and landing right between all the cruise ships. 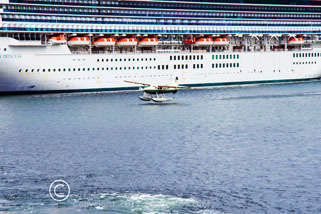 There were 5 large cruise ships in port while we were there, which made Ketchikan very busy. Our ship, being smaller, got to pull right up to town to dock, while some of the largest of the ships had to anchor out in the water and tender passengers in. We have been on cruises where they had to do that and it is a pain as it eats up your valuable time in port. 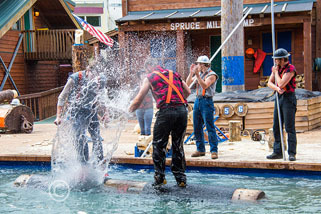 click photo to enlarge We had booked a lumberjack show, and a visit to the Saxman Native Village and Totem Park. 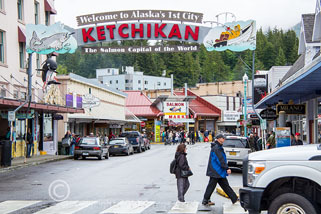 This was a pretty full agenda for Ketchikan, and it did not leave us much time to explore the city at all. We had to walk to the Lumber Jack show, so we did get to see the city on our walk. The lumber jack show was entertaining and fun and as soon as it was over we had to board a bus for the Saxman Village…. Poor Karen did not get any time to wander the gift shops. click photo to enlarge We were shown a video at Saxman Village about the carving of the Totems. Then we walked over to the Clan House for a demonstration of traditional dance and song by the Cape Fox Dancers. Next, we walked over to the building where the carvers were at work. 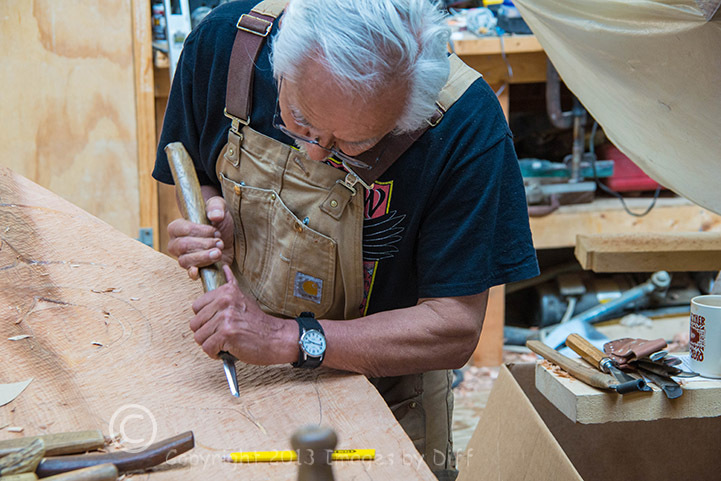 The master carver, Nathan Jackson, was there doing his thing and talking a bit to the tourists. They only get the crush of tourists for 3 months of the year and they make sure they have plenty of diversions for you.